Ainol is a brand name you've probably never heard before. That's because the Chinese company caters primarily to the needs of the Asian market. Needless to say, finding any of its products on sale in Europe or the U.S. is extremely unlikely, although one can always consider shipping one internationally as an alternative. But why would anyone want to buy any of the manufacturer's products at all? 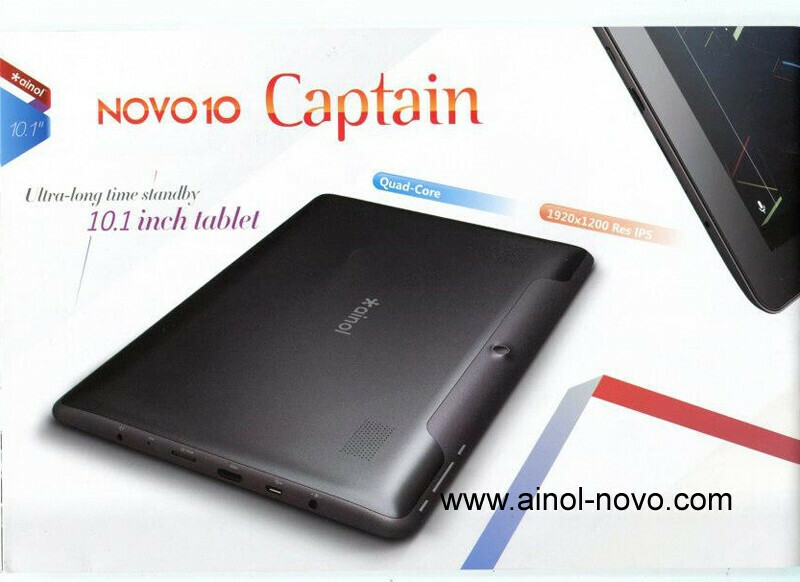 Well, here's a reason: the tablet you see here is the 10-inch Ainol Novo 10 Captain - clearly not the most vibrant name ever to be attached to a piece of gadgetry, but you might be surprised to know that the hardware inside the thing is actually a lot more impressive (at least in theory). We are talking about the IPS display on its front, sporting a resolution of 1920 by 1200 pixels. That is the kind of pixel density one would expect out of a high-end slate, such as the ASUS Transformer Pad Infinity TF700T. Then there's the processor inside it: a quad-core CPU clocked at 1.5GHz with Mali 400 graphics and 1GB of RAM. You also get a 2MP main camera, VGA front-facing snapper, HDMI output, GPS, and a 10,000mAh battery. Android 4.1 comes loaded on the device, according to its specs sheet. 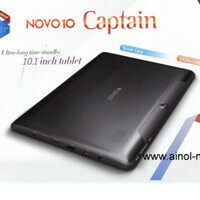 Interestingly, the Ainol Novo 10 Captain costs only a tad over $210, which seems like a pretty tempting deal. However, there is a catch - this is the price for the 8GB model, so if you want to have 16 gigs of storage, you'll have to drop about $260 on the table. The tablet is not yet available for sale, but its maker will start accepting orders in about a month. Chances are one will be able to have a Novo 10 Captain delivered to Europe or the U.S., although that might require paying a few dollars extra. Performance is not the issue with cheap Chinese tablets - they put the same HW into them - but built quality, support and warranty is, and you should pay the extra cost for a quality product with quality (local) support and quality updates. At the end of the day, shipping, customs and taxes included you pay close to $300 to such a Chinese piece, and intercontinental shipping costs if something goes wrong and have to send it back (something usually does, charging, power leakage, screen bleeding, SW inconsistencies, updates issues etc.) - no, I'd rather buy a quality product for $400 I can 100% trust over something for ~$300 and hope nothing goes wrong. im an asian and actually ainol isnt a bad tablet maker! its actually pretty good but not that good! very average! and not that good looking too! but just wondering what is the processor... its not stated there! is it exynos or snapdargon or tegra? but one thing for sure, for cheap 10" android tablet and trustworthy brand, better buy the nexus 10!!! i mean its nly $399 and it has already 32GB internal memory! i mean you'll spend almost same price if you want cheap tablet and you're in europe and US! 8 gig internal storage= NOOOOO! 1 gig of ram=NOOOOO! 2 MP main cam= NOOOOO! Extra $ to deliver in U.S.= NOOOOO! Name= BIG NO NO! yeah!! me too actually!! im going for nexus 10!! i mean its very cheap but with amazing specs! why buy this kind of tablet which no one knows about this(in western market that is)!? I hear ya, but it's not like capacitive screens were brand new two years ago. Also, resistive means no multi-touch. That's a huge problem. Asus transformer infinity 700 is a lot better. The specs are impressive, and as above stated Chinese tablets are for the most part great performers. The only drawback is that when you start it up and get mesmerized at the super cool little gadget, you then realize there is no Google Play or the possibility to install it. Kinda like having a Ferrari that runs on some kind of non existent fuel.